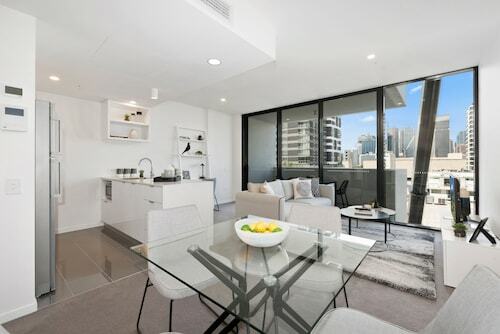 Situated in the entertainment district, this luxury apartment building is within a 10-minute walk of Castlemaine Perkins Brewery, XXXX Brewery, and Old Bishopsbourne. Frew Park and The Barracks are also within 15 minutes. Brisbane Milton Station is only a 3-minute walk and Brisbane Auchenflower Station is 15 minutes. 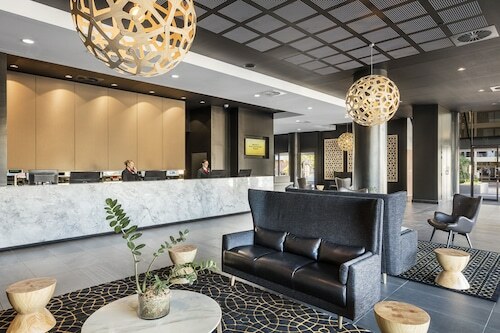 Located in the heart of Milton, this aparthotel is within a 15-minute walk of Castlemaine Perkins Brewery, XXXX Brewery, and The Wesley Hospital. Suncorp Stadium and South Bank Parklands are also within 1 mi (2 km). Brisbane Milton Station is 7 minutes by foot and Brisbane Auchenflower Station is 14 minutes. 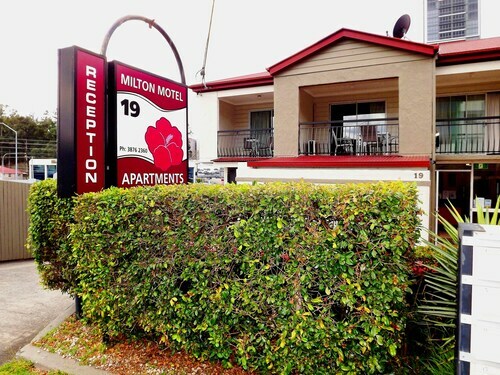 Situated in the business district, this aparthotel is within 1 mi (2 km) of XXXX Brewery, Caxton Street, and Suncorp Stadium. Brisbane Convention and Exhibition Centre and Queen Street Mall are also within 2 mi (3 km). Brisbane Milton Station is 7 minutes by foot and Brisbane Auchenflower Station is 14 minutes. Situated near the airport, this luxury bed & breakfast is within a 10-minute walk of Castlemaine Perkins Brewery and XXXX Brewery. Suncorp Stadium and The Wesley Hospital are also within 1 mi (2 km). Brisbane Milton Station is 8 minutes by foot and Brisbane Auchenflower Station is 17 minutes. 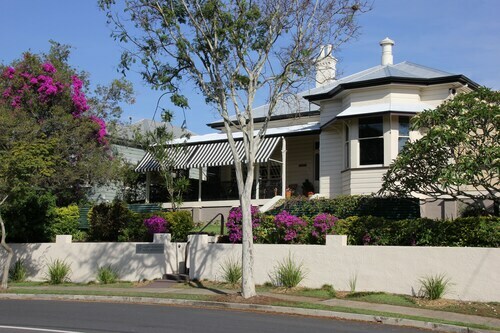 Next time you're in Queensland, make sure you visit the state capital of Brisbane and check out the interesting neighbourhood of Milton, which is located 2 kilometres west of the city centre. Thinking of visiting Brisbane? There is lots to see, such as the Queen Street Mall, the Brisbane Convention and Exhibition Centre and Roma Street Parkland. On your way to Milton? Sir Thomas Brisbane Planetarium is a worthwhile attraction to take a squiz at. Tourists and locals alike enjoy unwinding in Centenary Place. If you'd like to hit the hay nearby, check the rates at the Emporium Hotel and Spicers Balfour Hotel. Amble down Eagle Street Pier to chat to the locals and take in the sights. 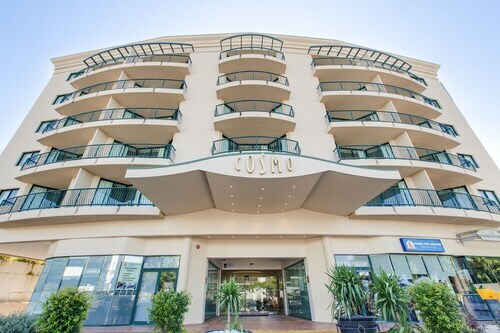 If this place is more your thing, take a look at the Brisbane Marriott Hotel and Quest River Park Central. The Central Cosmo Apartments should suit the needs of those travellers who are looking for a more luxurious place to sleep and relax in Milton. It won't be too hard to find The Gunshop Cafe during your stay in Milton, just follow the smell of fresh roasted coffee beans! As well as hot drinks, they provide plenty of sweet snacks to help keep your energy up. When you start craving some heartier fare, Riverside Hotel SouthBank should be your top pick. Whether you're eating alone or with a group, this popular eatery will be sure to impress. Can't secure that perfect Milton room? It is worth thinking about the hotel options in the Auchenflower hotels guide and the Wotif West End hotels guide. Wotif can sort you out with some great places to stay in Milton, so when you're ready to explore Brisbane, we're ready to take you there! How Much is a Hotel Room in Milton? Hotels in Milton start at AU$103 per night. Prices and availability subject to change. Additional terms may apply.